This post is from our sister website, NC Home Remodeling. NC Home Remodeling in Raleigh is an expert at taking out-of-date kitchens and putting a plan in action to maximize the potential of the space. We always want to take into account the client’s vision for their kitchen, as well. As you can see, the look was a bit outdated in color, style, and use of space. In addition, the client wanted a more neutral look so they would have more options regarding decorations. The existing style really limited their design choices. Working with the existing space, we brought a neutral color scheme that gives a sleek, classic appearance. The light fixture is a bold statement piece that can be switched out as styles change. The white, black, and silver are all neutral colors that allow the maximum of variability as they decide how to decorate the kitchen and surrounding rooms. Despite the look being timeless, there was a modern upgrade for the appliances. You can see, for example, the stove top was moved from a wall unit on top of the oven, to a built-in cooktop on the island. It gives the feel of a professional cooking space with lots of room around it to cut and prep. If you are considering a kitchen remodel, give us a call and we will work with you to develop a plan for your dream kitchen. 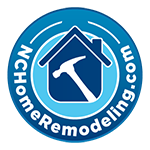 NC Home Remodeling serves the greater Triangle area, including Raleigh, Apex, Morrisville, Wake Forest, Durham and Cary. No Replies to "Kitchen Remodel in Raleigh"